While I’ve long taken up the banner of diversity in Star Wars as one of my pet causes, I have to confess that while I’ve gone to great lengths to quantify its in-universe demographics, I’ve never really spoken up about perhaps an even more important aspect—the demographics of the people making Star Wars. Part of it is that my sci-fi/fantasy interests have never extended much beyond SW and I’m just not familiar with a lot of female creators, and I think the other part is that—like with the lack of gay characters—the white guys have such an enormous lead that it’s hard to even know where to start. Luckily, Star Wars’ real-world component has made some decent strides on its own in the last several years; the departures of Karen Traviss and Sue Rostoni from the publishing program were followed by the arrivals of Karen Miller and Christie Golden and Jennifer Heddle, Lucasfilm’s public face is increasingly that of women like Kiri Hart, Amy Beth Christenson, Andi Gutierrez, and Vanessa Marshall, and of course, the whole damned thing was bequeathed by George Lucas in 2012 to Lucasfilm veteran Kathleen Kennedy. There’s still lots of room for improvement, however—notably, not a single female writer or director has yet been linked to any future SW film—and this awesome piece on women in comics over at that other “ThirtyEight” website inspired me to ask the gang for their recommendations on new female faces to join the Star Wars ranks. Here are their thoughts. » Read more.. While we’re only a couple of weeks away from the official premiere of Star Wars Rebels, it may be a while yet before we really know on a macro level what the show is about. The Inquisitor, after all, doesn’t even join the party until later on—and it remains to be seen just how big of a presence he’ll be in the first season as a whole, to say nothing of future seasons. The same goes for Lothal—it’s the heroes’ base of operations for now, but forever? I doubt it. So with that in mind, I asked the others to pitch their ideas for what you might call Rebels “bottle” episodes. Colloquially, a bottle episode of a TV show is a standalone story designed to be produced entirely using existing sets and contracted actors, meaning it can be produced for a bare minimum of expense—often these will show up to allow for something particularly extravagant elsewhere in the season. While I didn’t hold them to the “cheap” part, I did mandate that the story be entirely self-contained, so it could theoretically go anywhere in the first season without getting in the way of whatever the larger arc turns out to be. Here are their ideas. » Read more.. In our first “The Pitch” piece way back in November, we submitted some ideas for new Star Wars novels we’d like to see. At the time, the only books known to be forthcoming were Maul: Lockdown and Honor Among Thieves, and with the canon situation unresolved, no one really knew what to expect from Star Wars novels in 2014 and beyond—or whether there’d even be any. Shortly afterward, the announcement came down that the Star Wars comics license would be transferring from Dark Horse to Marvel at the end of 2014. Now, six months later, we’re in much the same position with comics as we were back then with novels—the last of DHC’s new offerings will be along next month, and as yet there’s been no information of any kind on what Marvel will be releasing next year (though with San Diego Comic-Con in a few weeks, I suspect we won’t be in the dark much longer). So this time, I asked the others to pitch their own Marvel comic series. This being our first Pitch article post-reboot, I also made it clear that ideas didn’t need to fall in line with the existing Expanded Universe. Here’s what we came up with. » Read more.. Shortly before continuity exploded, the staff of Eleven-ThirtyEight gathered to ponder some of our own “what if” ideas for the Original Trilogy, in honor of the classic Star Wars Infinities comics of the early aughts. I’m now proud to present round two, in which we push further than Infinities ever did, by which of course I mean go backwards, into the great goldmine of ill-considered decisions that is the Prequel Trilogy. You may notice a new name below, so let me also take this moment to welcome Rocky Blonshine, she of our recent feature article on the Rule of Two, and now our newest full staff member here at ETE! Welcome aboard, Rocky—you break it, you bought it. Jay: After watching Revenge of the Sith, we’d all wondered how it was possible that Obi-Wan could jump over Maul without injury while the same maneuver pretty much destroyed Anakin. As everyone knows, possessing the high ground gives you a +5 attack bonus. Suppose, then, that Kenobi was the one diced in half at the end of The Phantom Menace instead of Darth Maul — what changes? » Read more.. 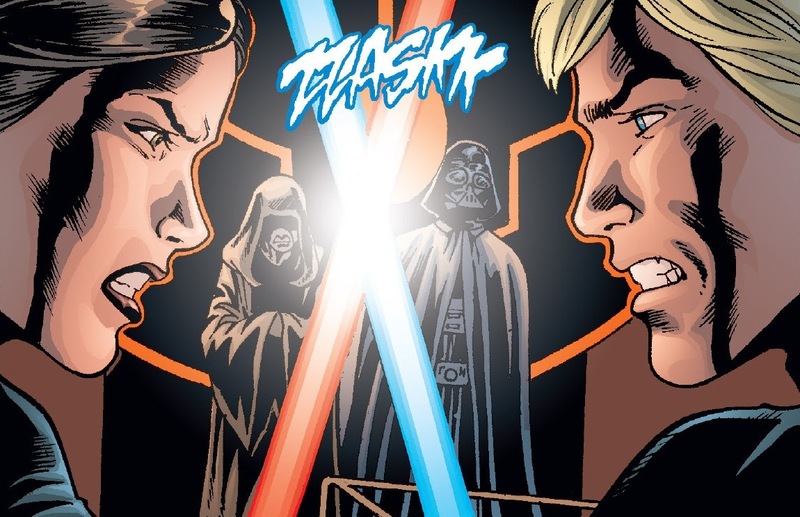 The Infinities series of comics, recently highlighted here by Alexander Gaultier, was basically Star Wars’ version of Marvel’s infamous series What If? Each of the miniseries started with one of the Original Trilogy films, then changed one key moment to see what would happen. The end results were…varied, in this writer’s opinion, but the mere concept of deliberately altering movie continuity was unheard of before then, and it’s a premise that still holds, as Alexander said, unlimited possibilities. Unfortunately, a few months back, writer Peter David revealed what I’d long suspected—that the series weren’t really as “unlimited” as it seemed. David was originally approached to write Infinities: A New Hope, but his idea was rejected for being “too dark” The story, according to Lucasfilm, still had to end with the good guys winning. This makes a tiny bit of sense when viewed through Star Wars’ mythological lens; it was foretold that the Force would return to balance somehow, so to go against that would contradict somewhat the very premise of the overall film saga. Nevertheless, why bother with Infinities at all if you’re not willing to screw with things? On its face, the original trilogy is a nonstop razor’s edge, where the slightest tweak at almost any time could have brought ruin to the main characters and the galaxy at large. Giving too many alternate paths to ultimate victory, I believe, does a disservice to Luke, Han and Leia’s struggles—and even the role of the Force itself in the proceedings unfolding as they did. » Read more..